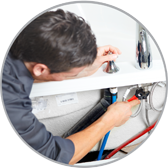 Trying to handle your own plumbing repairs can be tricky, as there are usually simple tips and tricks that only the pros know and which protect those plumbing repair jobs. While it’s always good to call a professional for any major work you need to have done to your home’s Plumbing in Scottsdale, AZ, a few simple tips can ensure that any work you perform on your own will last and not cause even more damage, and that you get the work done properly. When connecting two pipes or adding an attachment to a pipe such as a shower-head, you want to use plumber’s tape around the connection. This is a type of thin tape that is sticky on both sides and which helps to seal the connection. One reason you might notice water dripping down from behind your shower-head after you change it or find that you have water leaks after replacing certain pipes is because you may have neglected to use plumber’s tape. Look for this in your plumbing supply store and use just a few strips around any connection you replace on your own. Many homeowners don’t realize that when you connect pipes together, you need to match the metals and the materials. This means that you need to use copper pipes and copper connectors when adding to copper pipes, and PVC pipes and connectors if the other pipes in your plumbing are made of PVC. There are a few reasons for doing this. One is that different metals can cause corrosion when they’re joined and get wet. This in turn can mean water leaks around the connectors. Another reason is that some materials are stronger than others, and using something weaker than other pipes can mean that they don’t get supported. If you add PVC pipe to metal pipe, the PVC pipe may begin to bend under the weight of the metal pipes. This too can mean the connectors coming loose and water leaks appearing. Persistent drain clogs may be caused by pipes outside your home, as tree branches often wrap around these pipes and cause small cracks. In turn, dirt and other sediment can get into the pipes and cause clogs. Rather than consistently pouring drain cleaner down clogged bathtub pipes and sinks, it’s good to have professional Plumbing in Scottsdale, AZ inspect the pipes inside and outside your home to find out the real reason for persistent clogs and to get this addressed once and for all.